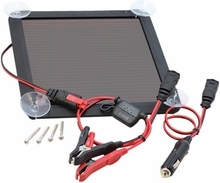 Solar Battery Charger Changes everything. No running a cord out to your scooter or motorcycle to charge battery up. You can leave the scooter covered up and where ever you keep it and charge battery and use the sun as power. Plus if power goes out you still can charge your battery. Works in low light, cloudy and overcast conditions. Chargers all 12 volt acid batteries.